The women’s voices weave around one another, evoking a strength that is both individual and collective. It’s rich, powerful music, and as you listen you begin to understand why it was deemed – by one bishop at least – too dangerous to be allowed to continue, and was banned. The year was 1539. The prelate was the Bishop of Verona, and the singers in question were people the Catholic Church has both consistently undervalued, and always instinctively recognised as a dangerous force: nuns. Women’s lives in sixteenth-century Italy were extremely limited, and convents gave them their best chance of autonomy and freedom. One of the most potent ways in which that was manifested was through music: and though much of the nuns’ output has been buried for hundreds of years, it is finally being unearthed and performed for a twenty-first-century audience. This month sees a landmark concert in London of music from convents across the hundreds of years of the Renaissance; its directors hope it will inspire a new generation of women musicians, and also that they might find convents willing to take on, and perform again, the tunes that are their birthright. Part of a year-long celebration of music by women, “Venus Unwrapped”, promoted by Kings Place in London, the concert down the road in St Pancras New Church is given by the ensemble Musica Secreta, under the title “Not Mortals, But Angels: The Flowering of Convent Music”. It’s a significant part of the celebration because for centuries it was nuns who kept women’s place in musical history alive, as Professor Laurie Stras (inset), one of the musicians behind the concert, explains. Like many people, she was unaware of the role of nuns until, 20 years ago or so, she decided to do a PhD while her children were young. She focused on an important group of women in sixteenth-century Ferrara, who held tiny, secret concerts in the city’s Castello. Creating and performing it, but not being acknowledged for doing so. In 1929 Virginia Woolf noted, in A Room of One’s Own, that for most of history, anonymous was a woman. What became clear to Stras was that, for most of musical history, anonymous was a nun; and the more she explored, the more convinced she became that inside their convent walls women were composing music, as well as performing it. 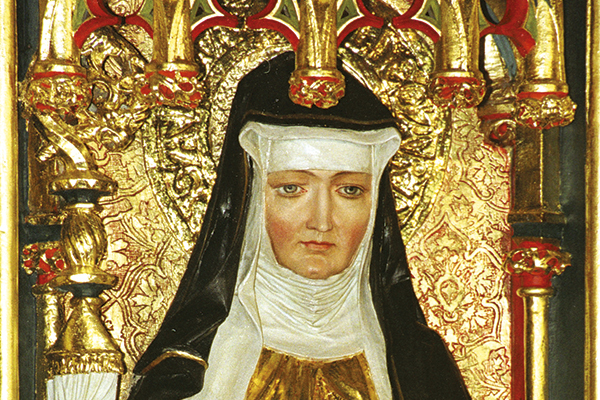 There were some standout figures, whose support for music was clear even if their individual contribution had been lost: St Catherine of Bologna (1413-63) known as the most musical nun of the fifteenth century; singer and composer Suor Lucrezia Vizzana (1590-1662); and before them the great Hildegard of Bingen (1098-1179), one of the most prolific of medieval composers. A personal favourite for Stras, though, was Leonora d’Este (1515-75), the only surviving daughter of the marriage of Lucrezia Borgia and her third husband Duke Alfonso d’Este of Ferrara. Lucrezia combined a reputation as a devastating femme fatale with an equally devastating career as a mother: most of her eight or nine pregnancies ended in miscarriage or stillbirth. She eventually died 10 days after the birth of a daughter in 1519, when Leonora was four; and because there was no one of suitable rank to raise her at court, Leonora was billeted to a Poor Clare convent, Corpus Domini, in Ferrara. By her mid-teens Leonora had decided she wanted to stay put in the convent; by 18 she had not only been professed as a nun, but had become the convent’s prioress. Over the following decades as its leader she put groundbreaking music at the heart of the community’s life, with a special emphasis on polyphony, in which individual lines of melody are combined to create a tune. This was a time when women had to keep their passions hidden, but the nuns – whose passion, of course, was Christ – were able to sing openly, and movingly, and sensually, about theirs. The result was explosive, and regarded as deeply dangerous by many prelates; hence the move of the Bishop of Verona in 1539, who pronounced that the nuns should put “the mental attention used to understand notation and the rules of music” to better use in the liturgy, instead of indulging their love of polyphony. One of the many fascinations for Stras in uncovering the musical legacy of Leonora and her fellow nuns has been learning about life in the convents. “I’m not a Catholic, so for me this was a whole new world,” she says. “I’ve had to learn a huge amount about not only the history of convents, but about Catholic tradition and liturgy.” But her own faith, as a Quaker, meshed naturally with the simplicity at the heart of the Poor Clares’ philosophy; and as well as visiting the convent at Ferrara, which is still a working community today, she nurtured an enlightening and supportive relationship with the order’s house at Arundel in Sussex, where for 18 months she spent two days a month, immersing herself into the age-old rhythm of the house. The work that has gone into uncovering the nuns’ music has been carried out in an appropriately sisterly, way: Stras’s partner in her project has been the soprano Deborah Roberts, who had been independently researching the role of nuns in the development of music when the two women met in the mid-1990s. It’s a noble ambition; and Stras is aware that, with dwindling numbers of convents in Europe at least, time is running out for the chance to restore this ancient music to its original setting. And it really matters. “The stories we are told as women about our history have a fundamental effect on the way we perceive ourselves as human beings,” she points out. Anonymous no more, the talented nuns of old can have a powerful influence on the women musicians of today and on generations to come, reshaping their heritage for an affirmed and recognised future. “Not Mortals But Angels: The Flowering of Convent Music” with Musica Secreta is at St Pancras New Church on 16 January. Women and Music in Sixteenth-Century Ferrara by Laurie Stras is published by Cambridge University Press.